Since my summer home is a cabin at Farmer's Market it seems fitting that I seem to have many planters this summer. This cute wagon had seen better days. The back of the seat had broken off and the green paint was worn. Red and black seemed just right for a fresh coat of paint. I had to make a few repairs. I drilled out the holes where the seat spindles had broken off and replaced the back of the seat. 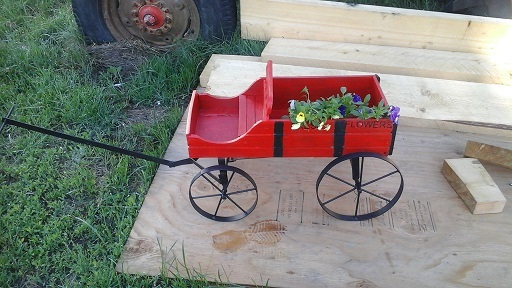 A little hard to see but I stenciled "Fresh Flowers" on the body of the wagon. It has gone to it's new home already! What a darling planter. Thank you for sharing at SYS and have a great week! Clever reuse of the wagon - I like it in red. Are you missing summer yet? I just want it to get cold so the roads aren't so slippery! Super cute, Marti! If I had been out shopping and seen this, I would have scooped it right up. Great find. Thanks for linking up with Vintage Charm.